Will he be the oldest president? 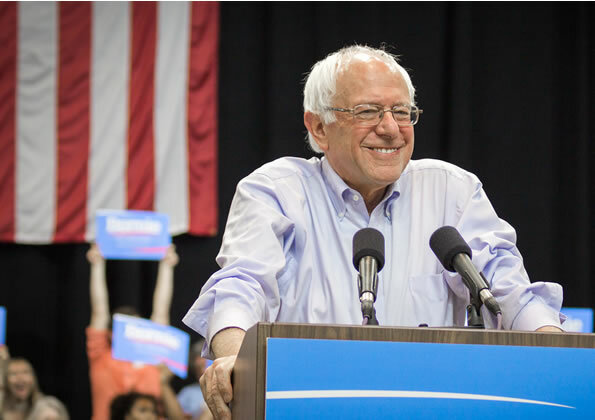 In November, when Americans head to the polls, Bernie Sanders will be 75 years old. If he wins the election, he will be 79 at the end of his first term. That would make him the oldest candidate ever to be sworn into office. Until now, the oldest president ever to be sworn into office was Ronald Reagan, at 69. Reagan was also the oldest president ever when he ended his presidency at 80. It’s worth noting, however, that if Donald Trump wins, he would also be the oldest at 70 years, and Hillary Clinton will be tied with Ronald Reagan at age 60 in November 2016. What have been some other old presidential candidates? Running for president at Bernie Sanders age is not without historical precedent. In 1808 Charles Pinckney and George Clinton both ran at the age of 69, as did 69-year-old James Monroe, in 1820. John McCain was 71 when he ran for president on the Republican ticket in 2008, making him the second-oldest nominee. In contrast, the youngest President ever was Theodore Roosevelt, sworn in at age 42. Because Roosevelt was actually sworn in after the assassination of William McKinley, John F. Kennedy was the youngest present to be voted into office as age 43. Marco Rubio is the youngest candidate in the current race, at age 42. Article II, section 5 of the Constitution of the United States stipulates that no person will be “eligible to that Office who shall not have attained to the Age of thirty five Years.” But there is no law setting a maximum age for the president. Bernie Sanders is Jewish by heritage and upbringing, but describes himself as “not particularly religious” and “not actively involved in organized religion.” Sanders was brought up in the Jewish faith. Growing up, he attended Hebrew schools on the weekends and had a bar mitzvah ceremony at the Kingsway Jewish Center in his boyhood home of Brooklyn, NY. As a young adult in 1963, he and his first wife volunteered at an agricultural kibbutz in northern Israel through the Labor Zionist youth movement Hashomer Hatzair. Sanders has claimed that his motivation for the trip was as much socialistic as it was Zionistic or religious. As mayor of Burlington, Vermont, Sanders allowed a menorah to be placed at city hall, and publicly inaugurated it by performing the Jewish ritual of blessing the candles. Sanders does not regularly attend a synagogue, and works on Rosh Hashanah, a day of rest for most Jews. Sanders’s wife, Jane O’Meara is Roman Catholic, and he has on many occasions expressed admiration for Pope Francis and his teachings. What has he said about religion?